First, you will need some Irish whiskey. I'm no expert, but Jameson and Bushmills are both reasonably priced and easy to find. If you want to try a more expensive spirit, go ahead. Can you make a good drink with bourbon or rye? Probably—it's just not what we are making here. Second, you will need some hot coffee. It might as well be something you already like. I roast my own beans, so I used a Brazilian dark roast, but you can use whatever type of coffee you normally drink. If you don't like the coffee, you won't like this cocktail. If espresso is your thing, try a little cafe Americano (pull a shot and dilute it with hot water). Whatever you pick, it's your drink, so you might as well have good coffee. You will also need some heavy whipping cream. This is double cream, not half and half, and it's definitely not pre-made whipped dessert topping, nor the stuff in a pressurized squirt can. We want to make a beautiful, thick, unsweetened cream layer, not a stiff, sweet, oily mess. Finally, you will need some brown sugar. First, pour some cream into a metal bowl and start whipping by hand with a whisk. Come on, it's not that tough. It only takes a minute or so to get some air into the cream and you'll begin to see it's volume increase. Don't worry about how thick it appears right now. As soon as you put the bowl into the refrigerator, the metal will conduct the low temperature into the whipped cream and it will start to get nice and thick. Give it a little volume and when you are tired of whipping, just put the bowl in the fridge, whisk and all, and we will come back to it in a moment. Now, start making your coffee, or if you already did that, move on to preheating your mug. Ideally, it's a stemmed goblet with a handle, but be careful. The shock of hot water on cold glass can cause it to crack, especially with thin, untempered walls and cold handles. The handle can upset the expansion of the glass, so sometimes a short whiskey goblet or even a wine glass works best if you don't have a proper Irish Coffee mug. A regular ceramic mug works too, so don't let glassware get in the way of a good drink. Once your glass is heated, empty it and add 4 ounces of hot coffee. Next, stir in two teaspoons of brown sugar. Just a little sweetener goes a long way, so some choose to use a single teaspoon. I like two because it helps blend the flavors of good, strong coffee with the whiskey. Don't skip the sugar because it's necessary to keep the cream afloat, and brown sugar contributes so much more to the drink than the plain white stuff. Now, add the whiskey, and you are almost finished. The final step is the cream. Take that bowl out of the refrigerator. By now it should be chilled and thicker than before. Whip it again and slowly whisk some over the top of your coffee. How much you add is up to you, but the idea is that you should enjoy a little cream with each sip. If your mug is glass, you should see a nice layered effect with the cream floating on top. Some say that the freshest cream will sink and that only cream that has been open for 48 hours will properly float. That may be something to consider if your cream decides to sink to the bottom. Did you skip the sugar? Whisk some heavy cream in a metal bowl until your arm is tired. Place it into the refrigerator. Preheat a mug and add hot coffee, stir in the brown sugar, then add the Irish whiskey. Float the cream on top and serve. Mixing whiskey with hot coffee isn't all that difficult, but for some reason, people shy away from making this drink because it seems like a lot of work to get the cream just right. It isn't. In fact, it takes a lot more effort just to make the coffee, especially if you grind your own beans (or even roast them). You are probably already making coffee anyway, so this doesn't add much more to that process. One obvious benefit here is that you can omit the whiskey altogether for younger guests or for those who choose not to consume alcohol. They can still enjoy the sweet coffee and freshly-whipped cream with everyone else. 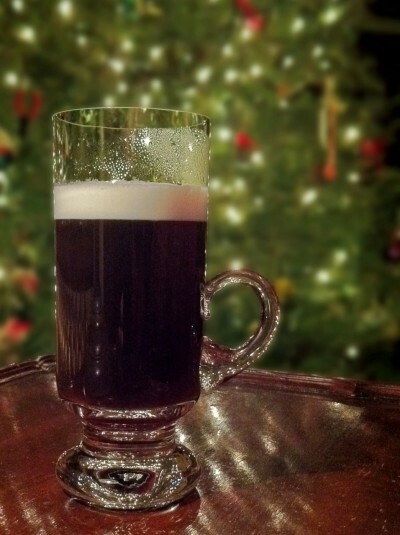 It makes Irish Coffee a versatile delight for the entire family. Now, isn't that just what you need on a cold winter day? Cheers, and happy holidays! Looks yummy! I’m so happy to make this Irish Coffee. This looks like the perfect Fall Time Recipe.